On just about every level, Poland and Australia are poles apart, but somehow they share the same economic success story: 27 years of uninterrupted economic growth. What’s their secret? 15563.97 km and one hemisphere separate Warsaw and Canberra. Factor in environment, language, culture, sport, history and pierogi, and the divide is even larger. But there is one number that unites both countries, a figure no other national economy in the world has ever reached in the history of capitalism: 27. For 27 years and counting, these seemingly disparate economies have been growing without registering two consecutive quarters of decline in a calendar year. They have both persevered through three decades of economic turbulence. Australia weathered the Asian Crisis in 1997, the Global Financial Crisis (GFC) in 2008 and the recent resources downturn, while Poland successfully negotiated its transition into a market economy in the 1990s, EU accession in 2004 and the 2008 crisis. I think there is a success story here to be told. Although Piñerúa was specifically talking about Poland, he could well have been talking about the Australian economy, too. In fact, according to the experts, both economies might be more similar than they first appear. To further explore this unlikely nexus, Poland Today called in the help of two Polish and Australian pundits with ties to both economies. Andrzej Rzońca is a professor of economics at the Warsaw School of Economics (SGH) and former member of the Monetary Policy Council of the National Bank of Poland (NBP), who travelled to Australia in 2016 on a research grant on behalf of the Australian Institute of Polish Affairs (AIPA), and Anthony Weymouth is the Senior Trade Commissioner for Central and South East Europe at the Australian Embassy in Warsaw. “The general recipe to avoid a crisis is quite simple: a country has to avoid booms. A crisis is, most often, a result of previous excesses,” said Andrzej Rzońca. Both Poland and Australia heeded this maxim in the years leading up to the 2008 GFC. As expected, Poland’s accession into the EU in 2004 ushered in a flood of foreign capital, along with the inflationary pressures that inevitably follow such a large influx. In close cooperation, the government at the time and the NBP were quick to react by tightening both fiscal and monetary policy respectively, as well as instituting a regime of tight financial supervision. For example, to reduce exposure to international currency markets, a limit was placed on the issuance of home loans denominated in foreign currencies (FX loans). The government had also managed to cut general government debt from 55.5% in 2003 to 51.1% in 2007. Down in Australia, the government and the Reserve Bank of Australia (RBA) had taken perhaps an even stricter line to fiscal and monetary policy. From Q2 1991 when it began to grow again to the GFC in 2008, the Australian economy had been booming on the back of a programme of trade liberalisation and labour deregulation in the 1980s, as well as the beginnings of the resources boom. The (Prime Minister) Howard government in 1996 capitalised on the vibrant conditions to deliver one budget surplus after another and pay off public debt along the way. General government debt fell from 55.4% in 1996 to 28% in 2007, just in time for the 2008 crisis. For this reason, the subsequent Rudd government had a war-chest of funds to inject into the economy through infrastructure investment and cash bonuses. They were also in a position to guarantee deposits and bank bonds to shore up confidence. Meanwhile, after almost ten years of monetary tightening, the RBA sat on the enviable cash rate of 7.25%, giving the central bank an ample amount of room to manoeuvre when the GFC hit. Within six months the RBA had cut the rate by 3%. “Luck matters for economic performance. However, cautious policies are needed to take advantage of good luck,” said Rzońca. The GFC hit Australia at a particularly auspicious time. The country was three years into one of the biggest and longest resources booms the world had ever seen, thanks largely to industrial revolutions taking place in China, India and other Asian neighbours. By 2007, the boom was deep in the investment phase. 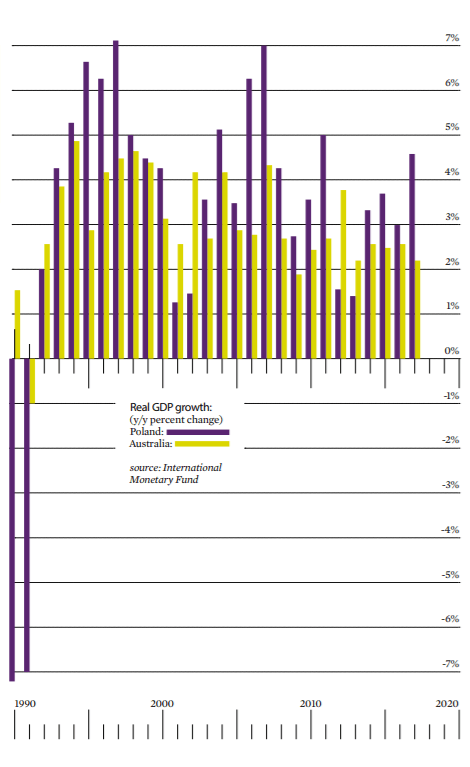 At its peak, mining investment amounted to around 8.5% of GDP, compared to 3.5% in the previous boom during the 1970s. This was not any old gold rush. This boom was driven by bulk commodities (iron ore, LNG, metallurgical and thermal coal), essential resources that the hungry economies of Asia could not forgo. Hence demand was assured despite the ructions in international markets. “Poland is a remarkable story. It has successfully leveraged its location and size over the last few decades to position itself as the key player in Central Europe and one of the most important new players in the EU,” said Anthony Weymouth. It certainly helps to be a member of a common market with a population of over 500 million consumers commanding a purchasing power of €25,000 each, not to mention neighbouring the fourth largest domestic economy in the world. And Poland takes, as Weymouth suggests, full advantage of this strategic location. Intra-EU trade represents 80% of Poland’s exports with Germany (27%) receiving the bulk. Poland also benefits from the 36 trade agreements that the EU has enacted with more than 60 countries. Meanwhile, Australia sits in a regional economy that is expected to account for 45% of the world’s GDP by 2022 – that’s more than two times more than in 1982. China and India alone are set to take up 30% of the worldwide pie. And guess who is Australia’s largest trading partner? China receives 30% of Australia’s exports, while Asia in total accounts for 66%. “From my perspective, Poland’s key strength is its diversified economy. No one sector dominates, and this protects the economy from downturns (like the GFC),” said Weymouth. The Australian economy takes a similar shape, although not necessarily in geographic or industry terms. Services might account for over 70% of Australia’s GDP, but the sector is broken up into 19 different segments, which are relatively evenly sized. For example, there is only a 6.8% difference in real gross value added (GVA) between the highest contributor (Financial and Insurance Services, 9.4%) and the lowest (Accommodation and Food Services, 2.6%). What’s more, two different economies (the mining industry and the rest) were effectively operating simultaneously in Australia when the GFC hit. Poland, on the other hand, is truly a nation of cities, as this Poland Today issue would have it. Out of the 923 cities and towns that make up country, 23 contain a population of more than 100,000 and 16 with more than 200,000. 55.8% of Poles work in services, 30.4% in manufacturing and 11.5% in agricultural, forestry and fishing. This all makes for an extremely agile economy. William Hastings Burke is an Australian writer based in Warsaw. In 2010, he brought the WWII-rescue story of Albert Göring to the world in his book ‘Thirty Four’ and the BBC documentary ‘Goering’s Last Secret’. 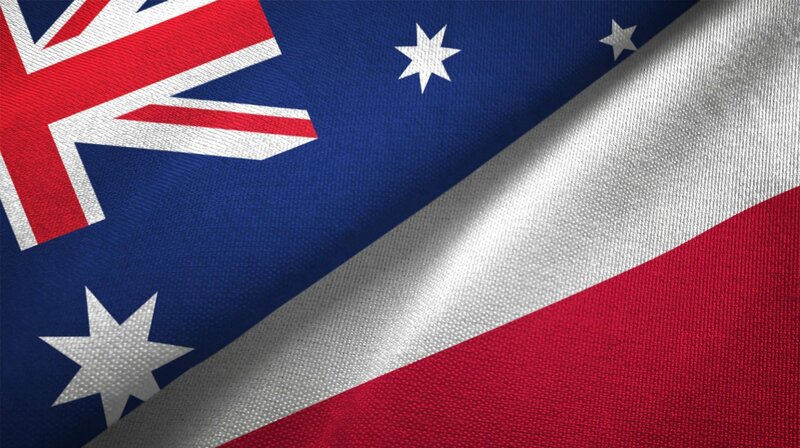 Australia and Poland have both persevered through three decades of economic turbulence. Australia survived: Asian Crisis (1997) and Global Financial Crisis (2008). Poland transitioned into a market economy (1990s), joined the EU (2004), and survived the 2008 crisis. William Hastings Burke is an Australian writer based in Warsaw. In 2010, he brought the WWII-rescue story of Albert Göring to the world in his book ‘Thirty Four’ and the BBC documentary ‘Goering’s Last Secret’. 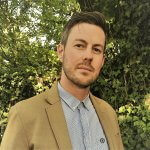 He has studied in the US and Australia, ultimately obtaining an Honours degree in Economics (Soc. Sc.) from the University of Sydney. He has lived in Poland since 2014, researching and writing, among other projects, his second WWII epic.